Foreign Minister Yang Jiechi Meets Children from the "Chinese Class"
In the evening of December 4, visiting Chinese Foreign Minister Yang Jiechi, met Children from "Chinese Class" of the Chinese Embassy in the UK. 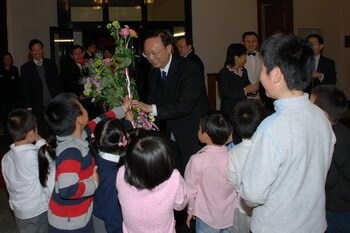 Upon arrival at the Embassy, Minister Yang was warmly welcomed by the children with flowers and applauses. Minister Yang had an intimate chat with them, asked about their study and life, and presented them books and stationery. The atmosphere was warm and genial. Minister Yang denoted that children are flowers of our country. It is of significance for the Chinese Embassy in the UK to open "Chinese Class", which not only relieves worries of the parents, but also strengthens Chinese education of the accompanying children. Minister Yang thanked the teachers for their assiduous work and encourages the children to study hard and grow up healthily and happily. 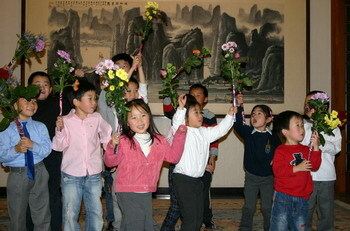 The children expressed their thanks to Minister Yang with lively songs. Later, Minister Yang took photos with the teachers, children and their parents.